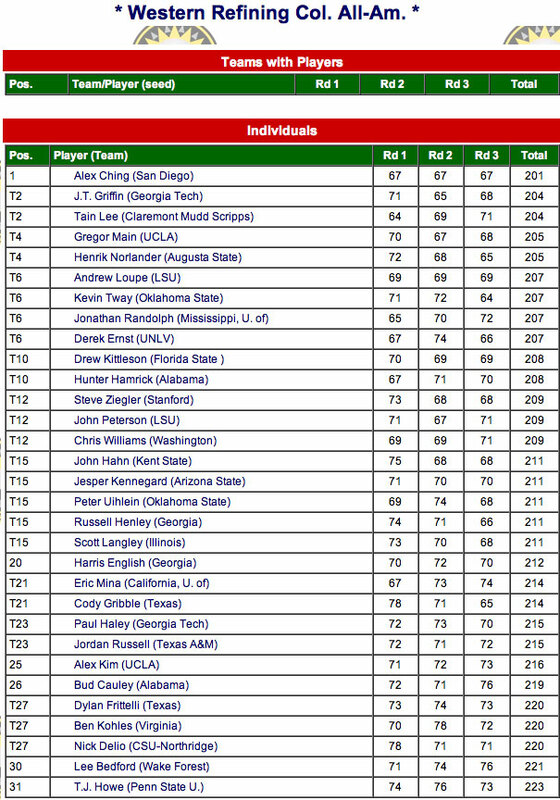 Senior Steve Ziegler finished in a tie for 12th in an elite tournament of college All-Americans played in El Paso. The event is known as the Western Refining College All-American Golf Classic and is considered one of the finest college events of the year. Past champions include Tiger Woods, Davis Love III, Notah Begay and Matt Kuchar. 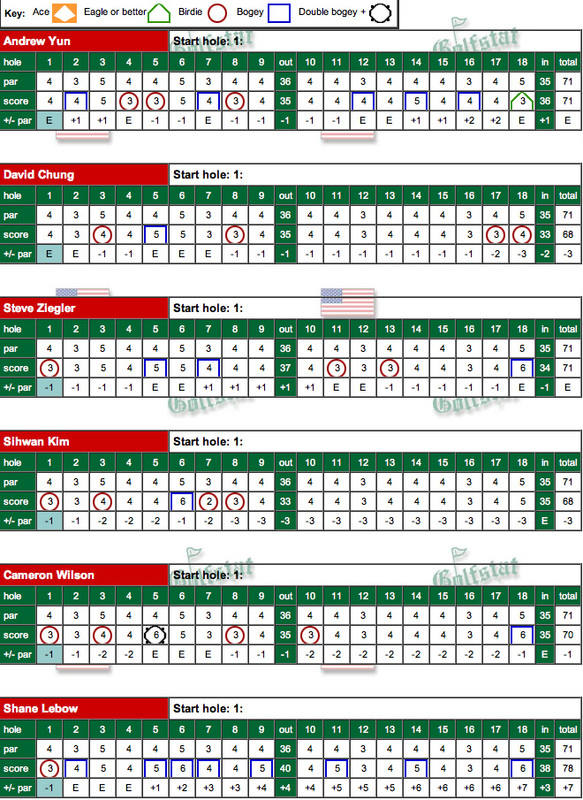 Steve had rounds of 73-68-68 in the event with the scoreboard included below --- click to enlarge the image. The field included the current US Amateur champion, the current NCAA champion and 29 other top collegiate players from throughout the country. The event was played at the El Paso Country Club. With a field that includes the U.S. Amateur champion, the NCAA champion and the returning event champion, the 2010 Western Refining College All-America Golf Classic looks to have its deepest field ever when it begins play this weekend at El Paso Country Club. Thirty-two of the nation’s premier collegiate golfers are headed to El Paso this weekend for the 36th edition of the tournament that features returning champion Hunter Hamrick of Alabama, 2010 U.S. Amateur Champion Peter Uihlein (Oklahoma State) and 2010 NCAA Champion Scott Langley (Illinois). Throughout the years, many Western Refining College All-America Golf Classic competitors have gone on to pursue successful careers in the Professional Golfers’ Association of America and on the PGA Tour. Some of the past champions include Ricky Barnes (2000), Notah Begay (1994), David Duval (1991), Matt Kuchar (1999), Davis Love III (1984), Chris Nallen (2003), Jerry Pate (1974), Nicholas Thompson (2004) and Tiger Woods (1995). Here's the official press release about Stanford 2011-12 incoming freshman recruits -- more about the three below the press release. STANFORD, Calif. - The Knowles Family Director of Men's Golf, Conrad Ray, has announced the signing of three talented high school seniors, Patrick Grimes, Marcel Puyat and Patrick Rodgers. All three players will join the Cardinal next fall as part of the Stanford Class of 2015. Grimes, who grew up locally in Palo Alto and attends Menlo School in Atherton, CA, is familiar with The Farm. An annual participant in the Stanford Summer Golf Camps, he arrives as a highly rated Northern Californian junior prospect having won the 2008 AJGA Junior All-Star tournament at Marshallia Ranch, the 2008 AJGA Trader Joe’s Junior Championship played at the Castlewood Country Club - Hill Course, and the 2010 Mayacoba Junior Classic. Other notable performances include the 2010 Central Coast Section title on his way to a sixth place finish at the CIF State Championships in Santa Maria. semi-finalist showing in the 2010 San Francisco City Championship, 2nd place in the 2010 Palo Alto City Championship and 8th in the 2010 Silicon Valley Amateur. Puyat, resident of Indio, CA will graduate from La Quinta High School. He was born and raised in Manila, Philippines, moved to The States in 2007 and worked his way to a current ranking of 27th in the high school class of 2011 by Golfweek / Sagarin. In 2009 he won his USGA US Men’s Amateur Championship Sectional Qualifier held at Avila Golf Club in Tampa and then went on to reach the round of 16 in the US Men’s Amateur Championships held at Southern Hills Country Club and Cedar Ridge Golf Club, Tulsa, Oklahoma. Likewise, he reached the round of 16 in the 2009 USGA Junior Amateur Championship held over the Trump National Golf Club in Bedminster, New Jersey after winning the sectional qualifier at Hideout Golf Club, Naples, Florida. 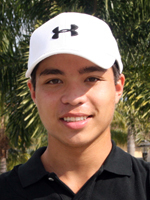 Puyat was the medalist in both the Junior and Amateur in 2009. Alongside his US tournament record, he joins the Cardinal with many international tournament accolades on his impressive resume. 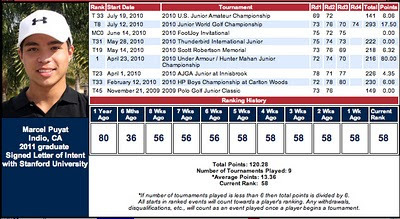 Rodgers, from Avon, IN and Avon High School is currently ranked 7th in the high school class of 2010 by Golfweek / Sagarin and has stood out from his class in both golfing and academic performance. Rodgers is a two-time winner and defending State High School Champion in Indiana. He is a two-time HP Scholastic All-American in 2009 and 2010. Rodgers was named first team Rolex Junior All-American in 2009 and 2010 and Honorable mention in 2008. 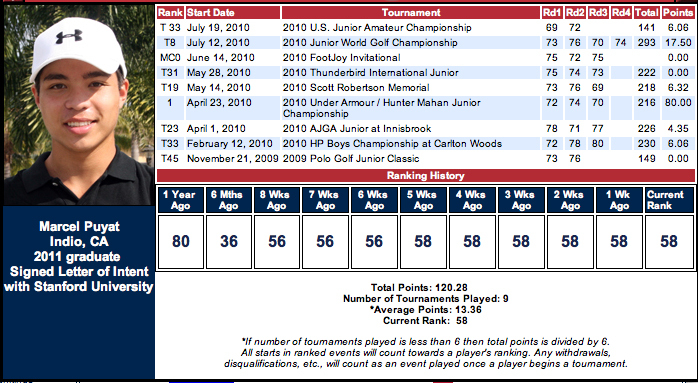 This recognition was behind the strength of nine top-10 finishes in his career on the AJGA Tour. 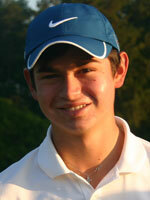 Rodgers won his first AJGA event at The SAP Junior Open in 2009. He also was a match play qualifier in the USGA Junior Championship in 2008 and 2009 and competitor in the 2010 US Amateur. Most impressively, Rodgers is ranked No. 1 in his class of 582 at Avon High School. Grimes, Puyat and Rodgers will join the team in fall of 2011. 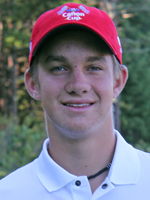 The YouTube video below of the 2010 Illinois High School Championship includes an excellent interview of Patrick Rodgers that begins in the middle of the video - Patrick won shooting a 67-64. The funny YouTube video below shows Patrick Grimes receiving golf lessons from a friend. The Gifford Collegiate background can be found below as the most recent results will be posted first after each round. 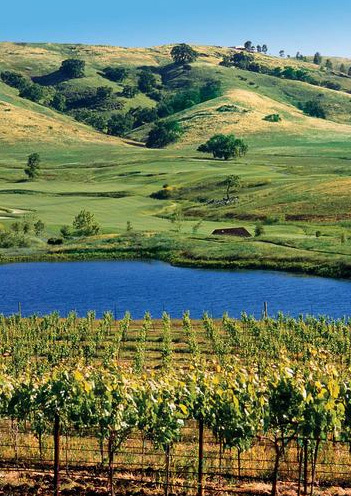 CordeValle, the PGA Tour caliber host course, is located about 45 miles from the Stanford campus. ROUND THREE SUMMARY - Stanford couldn't hold off surging UCLA over the final 6 holes finishing 2nd in the tournament despite leading by 11 strokes going into the final round. UCLA ended up picking up 24 shots on the Cardinal in round 3 to win the event by 13 strokes. The story was told over the final 6 holes with Stanford leading by 5 shots. Over the last 6 holes the Cardinal was 16-over par collectively while UCLA was 2-under par, a difference of 18 shots. Of special note was the final stretch by UCLA's Figueriedo finishing with 5 birdies and one bogie over the last 6 holes leading to his 66. The Cardinal was led in the 3rd round by a solid 2-under 69 from frosh Cameron Wilson who finished with another top ten (77-70-69) in his excellent season thus far. Next best on the day was Andrew Yun's 73 on his way to a 15th place finish (74-71-73). Sihwan Kim had a solid tournament finishing 6th overall after rounds of 71-68-74. 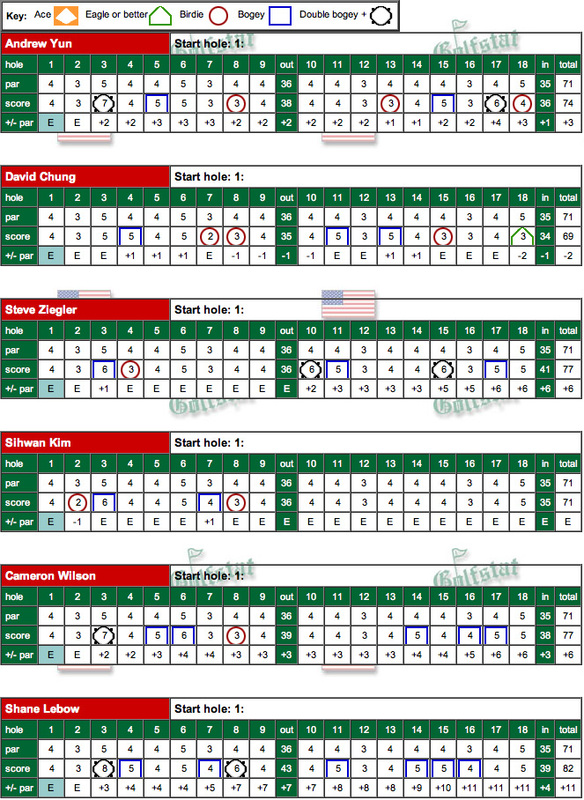 David Chung, in his first tourney of the year, finished tied for 9th despite a disappointing final day (69-68-79). Steve Ziegler finished tied for 30th (77-71-76) as he was on his way to a fine 3rd round but finished 6-over on his final 6 holes. Freshman Shane Lebow ended in 74th with rounds of 82-78-83. Complete final round scoring can be found below. Complete event scoring can be found here. Now it's time off as the fall season has ended - the next event will be in early February on the island of Hawaii at the Mauna Lani Resort North course. My guess is that this disappointing ending to the fall season will find the Cardinal that much hungrier to excel in the all important spring championship season. Everyone will know exactly what they need to do to improve individually and as a team. Watch out UCLA and the rest of the collegiate golfing world. ROUND TWO SUMMARY - Stanford charged into the 2nd round lead by 12 shots over #1 ranked UCLA improving its scoring 20 strokes from round 1. Leading the way with a pair of 3-under 68s were David Chung (69-68 2nd place individually) and Sihwan Kim (71-68 3rd place). David and Sihwan each had 4 birdies and one bogie on the day. 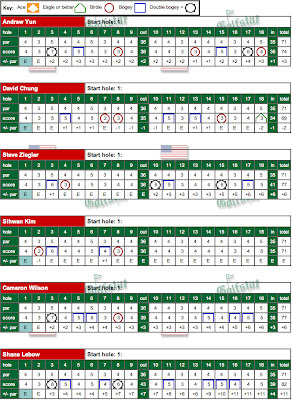 Strong 2nd round play by Cameron Wilson (77-70 T19), Andrew Yun (74-71 T11) and Steve Ziegler (77-71 T24) completed the 5 players whose scores counted towards team play. Freshman Shane Lebow also improved in round 2 (82-78 75th). It was a day of contrasts from round one as the team was 7-under (lowest of the day) vs. 13-over on day one, recorded 19 birdies vs 10 in round 1, had 5 players even or under par vs. 2 on round 1, and the team played the par 5 3rd hole 3-under vs. 9-over on round 1. Playing together, Andrew Yun eagled the 18th while David Chung birdied the par 5 finishing hole. 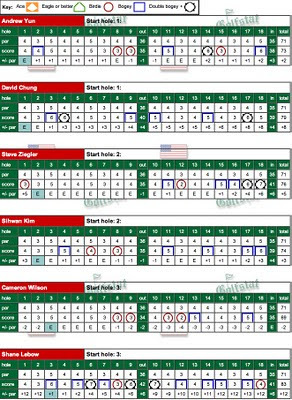 The 2nd day scorecards are found below --- click to enlarge the image. 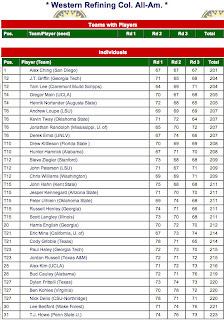 ROUND ONE SUMMARY - The Cardinal is in 2nd place after the first round, one stroke behind #1 ranked UCLA. 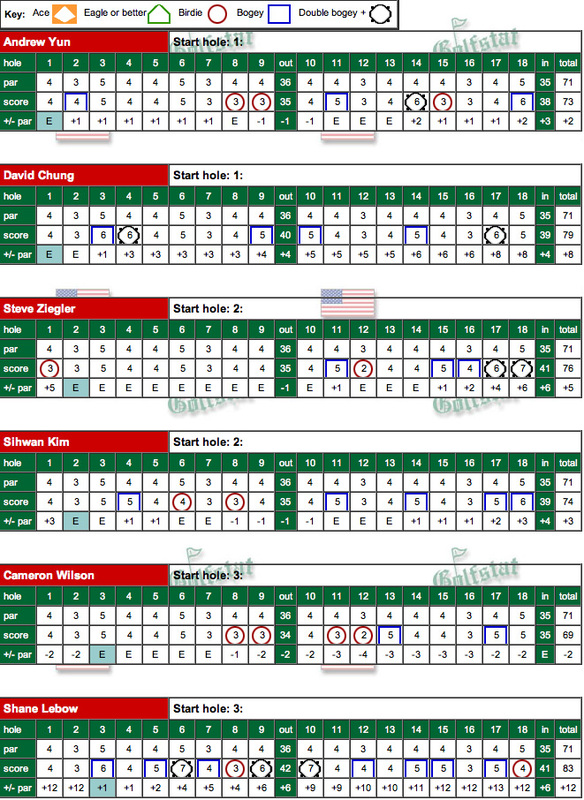 Stanford was led by junior David Chung's 2-under 69, a round that has him in 2nd place individually, as his play was highlighted by a dramatic eagle 3 on the 18th hole. Senior Sihwan Kim, a previous winner of this event in 2007 and a runner-up last year, shot a solid 71 putting him in 3rd place individually. Next was Andrew Yun's 74, Steve Ziegler and Cameron Wilson's 77's and Shane Lebow's 82. The best 5 out of 6 scores count leaving the Cardinal 13-over par as scores were high on this tough CordeValle course that is rated at 75.3 with a 144 slope. The par 5 third hole proved to be the toughest challenge for the team as the team collectively had one par, two bogies, two double bogies and one triple bogey on this hole - the team was 9-over par on this one hole. Only a total of 10 birdies and 1 eagle were recorded by the team. 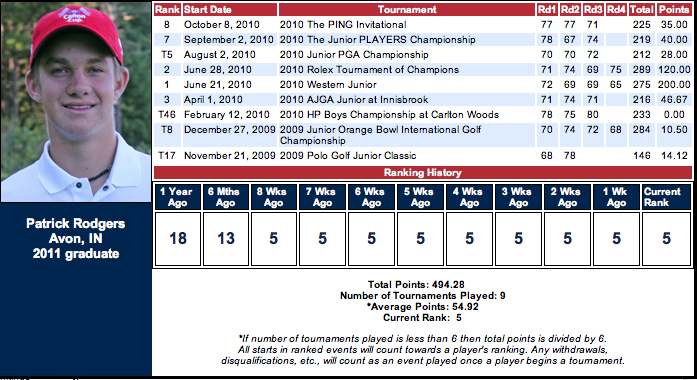 First round scorecards can be found below --- click on the image to enlarge. The 6-man team is set for the upcoming Gifford Collegiate tournament being played nearby at CordeValle in San Martin, CA Nov 8-10. This event will mark the 2010 debut of Stanford's All-American and US Amateur runner-up David Chung, who just returned from Buenos Aires and the World Amateur where he represented the US on its 3-person team. 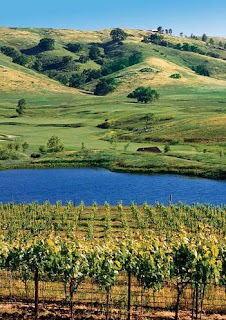 CordeValle GC was the site of a recent PGA Tour event won by Rocco Mediate. Live tournament scoring by GolfStat is available. See practice round videos below. The team includes Andrew Yun, David Chung, Steve Ziegler, Cameron Wilson, Sihwan Kim and Shane Lebow. The field of 12 teams includes 5 teams ranked in Golf Week's top 25 including #1 UCLA and #6 Augusta State. 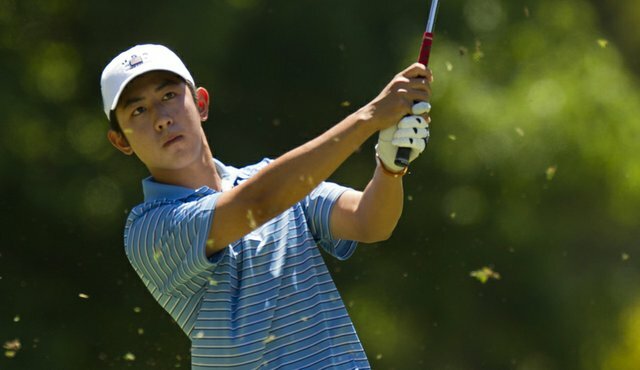 Stanford is ranked #16 after it's first 3 tournaments played without top ranked All-American David Chung who returns from his recent play representing the US in the World Amateur in Buenos Aires. The format for the event is unusual in that 6 players for each team compete with the 5 low scores each round counting towards the team score. Typically 5 players compete with 4 scores counting. During the practice round on Sunday, Nov 7, light rain moved in so the course should be playing longer with the softer conditions. The weather is expected to clear during the tournament. The 6-man team is set for the upcoming Gifford Collegiate tournament being played nearby at CordeValle in San Martin, CA. This event will mark the 2010 debut of Stanford's All-American and US Amateur runner-up David Chung, who just returned from Buenos Aires and the World Amateur where he represented the US on its 3-person team. CordeValle GC was the site of a recent PGA Tour event won by Rocco Mediate. Live tournament scoring by GolfStat is available. All-American David Chung makes his 2010 debut -- David Chung did not compete as he was returning from the World Amateur being played in Buenos Aires where he helped the US finish in 3rd place behind France and Denmark. David tied for 9th individually with rounds of 73-70-73 in tough conditions with pouring rain in much of the tournament. Congratulations David on your selection and top play in this outstanding event. Here are complete scores from the World Amateur. | The event's website can be found here. | Golf Week had excellent coverage of the event and David's outstanding 2nd round in pouring rain was chronicled in this article.